Every human body needs food, it is a basic important need for normal growth, development and energy. Nutritious food plays a vital role in the promotion of health and disease prevention. Our body: The human body is just like a machine. Like an engine burning up fuel, in order to generate the required energy, the human body uses the consumed food in order to generate the driving forces to keep the heart beating, the lungs breathing and the limbs functioning. Acute hunger is sudden and life threatening. It needs immediate and intense treatment. The cause can vary, depending on the situations such as conflict or natural disaster. Acute hunger accounts 8% of the world’s hunger. Chronic hunger is gradual and occurs seasonally. When occurred, it can last for generations. It is less visible but affects many people. Both Acute hunger as well as chronic hunger can lead to malnutrition. Nutrition: The terms ‘food’ and ‘nutrition’ are sometimes used synonymously. Literally, it is not right. Food is a composite mixture of various ingredients that is consumed for nutrition. On the other hand, nutrition connotes a dynamic process in which the swallowed food is utilized by the human body for nourishment. Malnutrition: The term “Malnutrition” means ‘badly nourished’. As much about what you eat is how much your body get nourished. When there is inadequate intake of protein, energy or carbohydrates or by frequent sickness or infection. Widely, there are many myths about the cause of hunger which generally misleads the people and keeps them from collectively helping to end hunger. Myth 1: There is not enough food in the world for everyone to eat. Reality: Not all people have the required access to buy food or cultivate them. Myth 2: Natural disasters and famines which cannot be controlled by people causes hunger. Reality: This is a generalized term. Approximately 8% of the hunger problem in the world is caused by natural disasters and famine. Reality: Contrary to the myth believed by people, overpopulation is never the root cause of hunger. But it can be the other way around – hunger can be a primary cause of population explosion. If there are more children in the family, some children can survive by working and taking care of the family. This adds to the income of the family and later to take care of the family in many ways and various situations. These nutrients are usually got from the food we eat every day to stay healthy, active and productive. Protein – builds, maintains and repairs the body’s muscle, blood, skin, bones and other tissues and organs in the body. Meat, eggs, dairy and fish are the common foods that are rich in protein. Carbohydrate – is main source of energy that is being provided to the body. Carbohydrates can be classified into two kinds; starches and sugars. The common starch rich food include rice, maize, wheat and potatoes while food rich in sugars include fruit, honey, sweets and chocolate bars. Fat – This is also known as the body’s secondary source of energy. Fat helps people survive through during cold weather and actually is responsible for more energy or calories per gram than any other nutrient. Compared to the other nutrient, fat is more difficult to burn. 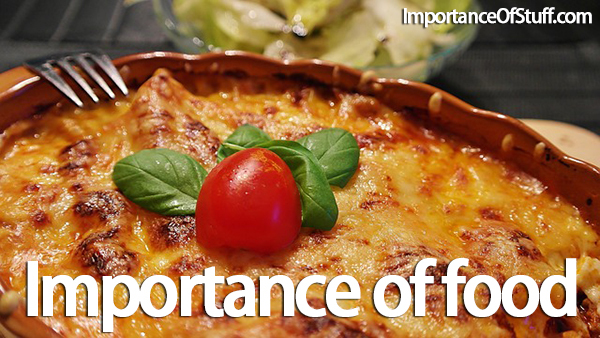 Food rich in fats are oils, butter, lard, milk, cheese and some meat. Vitamins and Minerals – Vitamins and minerals are needed in very small amounts by the human body and are sometimes called micronutrients, but are essential for good health, especially for the organs in the body. They basically control many functions and processes in the body, and in the case of minerals also help build body tissue such as bones (calcium) and blood (iron). Ever since the discovery of vitamins, the world has redefined the science of nutrition. Thus, food is a very basic necessity for every human body to survive and to be healthy.